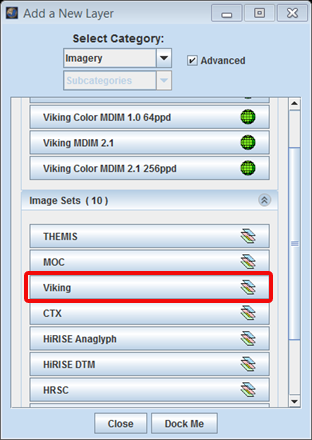 Open the Stamp Layer: Chose "Add New Layer" -> "Imagery" -> "Viking" OR Chose "Add New Layer" -> "Instrument" -> "Viking" . Enter Search Parameters: It is not necessary to enter values for each parameter, but the more specific your search the faster it will be. The allowable values for each field are given in the quick reference table below followed. 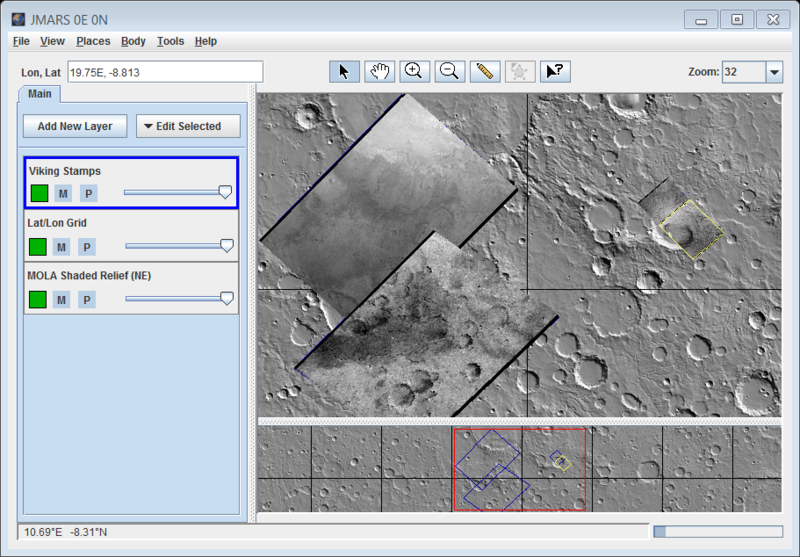 This field identifies which of the two identical Viking orbiters were used to acquire the observations. Viking spacecraft orbit during which an observation was acquired. 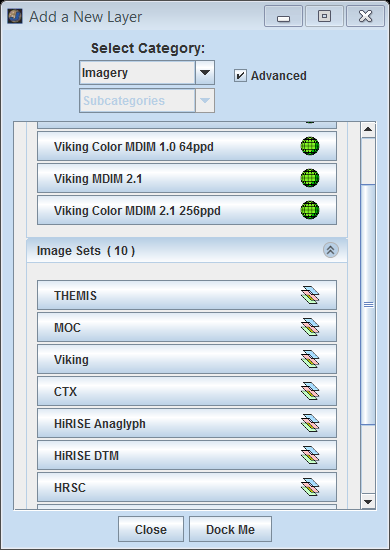 The VIS subsystem consisted of two identical cameras: A & B. The "horizontal" resolution of the image pixels, in km/pixel. The "vertical" resolution of the image pixels, in km/pixel. 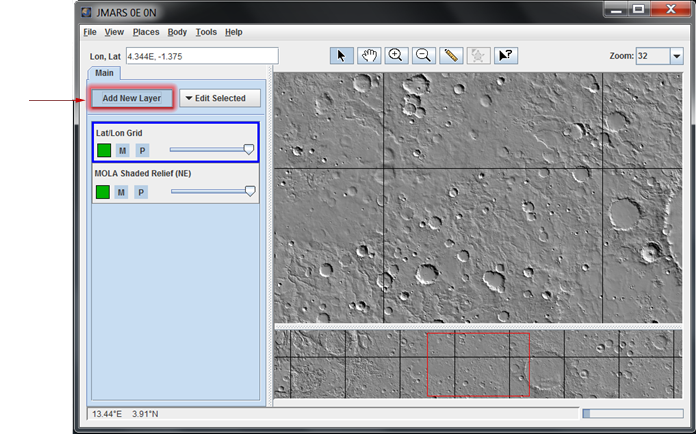 This is the angle between the sun, the surface, and the Viking orbiter at the time the picture was obtained. Derived for the center of the image, this is the angle between the Sun and a "normal" line drawn perpendicular to the planet's surface at the time the image was acquired. A higher incidence angle means that the sun closer to the horizon. 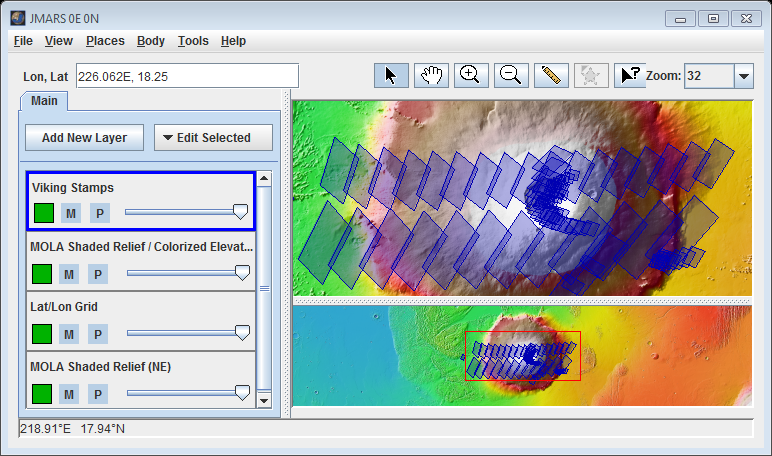 Measured from the center of the image, this is the angle between the Viking orbiter and a "normal" line drawn perpendicular to the planet's surface. A short description or miscellaneous information about the image. 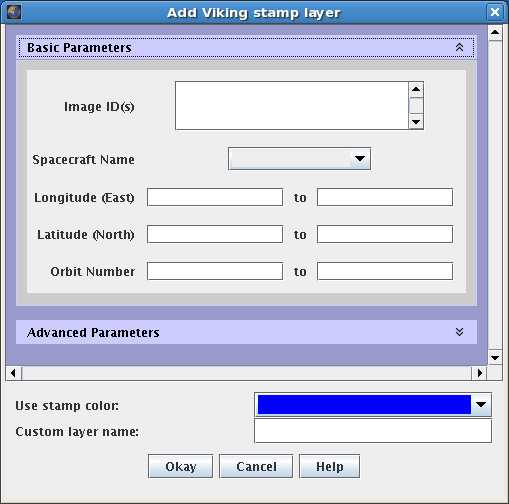 The Viking Camera Stamp Layer's functions are identical to the functions of the Stamp Layer and are explained in detail on the Stamp Layer page.